John Day’, directed by first-timer Ahishor Solomon, is a film that should come with a statutory warning. The convoluted plot gives you a throbbing migraine, but I’d also caution you to go see this film on an empty stomach or you might lose your lunch over the gut-churning violence depicted throughout. The film then is sloppy and contrived; it’s an unoriginal and uninspiring thriller that’s let down by flabby writing. I’m going with one-and-a-half out of five for ‘John Day’. Shernaz Patel, who plays the part of Naseeruddin Shah’s wife, spends more than three-fourths of the film passed out in a coma. Lucky her. JOHN DAY is dark, sinister and edgy. You need to have a strong stomach to absorb the aggression and ghastly sequences that unfurl on screen. Also, the usage of expletives is another characteristic that might make you slightly uncomfortable, although it gels well with Randeep’s character and the temper of the motion picture. 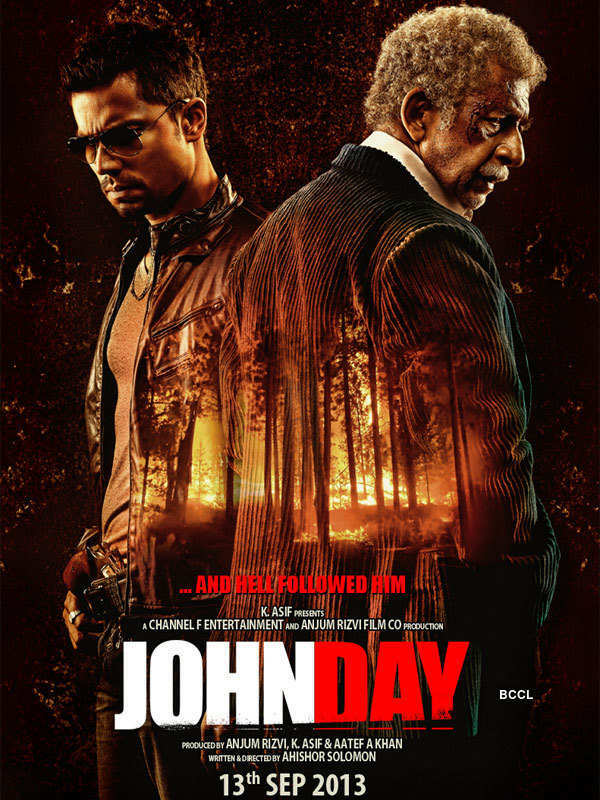 JOHN DAY is a forceful and intense film and the director gets it right by casting two intense actors, who add a lot of weight to the goings-on. On the whole, JOHN DAY is a razor-sharp thriller with an engaging screenplay, high-voltage drama and sterling performances as its aces. A film like JOHN DAY is a leap in the right direction. It reinforces your faith and trust in qualitative films and deserves to be supported. Strongly recommended! At one point, a character bites someone’s tongue off. I think it’s supposed to be dark and gritty. It’s just tiresome. Naseer sleepwalks while Randeep snarls, growls and takes long, angry drags of cigarettes. Stealing a line from the great American critic Gene Siskel, I asked myself: Is this film more interesting than a documentary of the same actors having lunch? The answer is no. I’m going with one and a half stars. Inspired by Box 507 (Spain, 2002), John Day is a slow, cumbersome watch that takes too much time to tell too little. John Day claims to be an “edge of the seat thriller” on its poster. Considering the makers didn’t set out to make one in the first place, one wonders how convinced they were about their own effort. John Day, a rip-off of Spanish thriller Box 507, is dark, edgy and brooding thanks to the execution and background score. The debutante director manages to create a mood of suspense as he keeps things unpredictable, especially towards the beginning. However, as the film progresses, the pace drops, scenes look repetitive and the story gets so convoluted that you lose track of characters and their motives. John Day initially gives an impression that it’s all about decoding a puzzle or unravelling a mystery at breakneck speed. Unfortunately, that’s not the case. It’s gripping but like the characters, the plot is way too ambiguous, deceitful and tedious for your liking. Viewed differently, there are some scenes of such gruesome violence that they will repulse the womenfolk and family audiences. Also, the entire drama is tension-ridden with no light moments or entertainment, adding to the monotony of the viewers. On the whole, John Day is confusing and boring and has very little to entertain. It will, therefore, not be able to create any mark at the box-office. Its poor opening will only add to its tale of woes. The trouble is not with the sight of so much flowing blood that looks horribly realistic (you’d be surprised at how ketchupy some of the red stuff looks, still, in so many films). Or with female characters lying around in a state of post-coital disarray. The trouble is that there is no coherent plot to hang all of this on, it’s just a series of jumbled scenes with too many characters walking in and out, or limping in and out, or being shot at and huddling about in bloody heaps. While John Day is supposed to be based on a very ‘philosophical’ line of thought, I really didn’t get the excessive use of religious imagery to prove a point. The film’s background music doesn’t help either — it’s there just for the heck of it. John Day fails as a thriller. I suppose it had a run time of approximately two hours, but it felt more like five. Despite the references and images used in the film, the attempt to come off as an intelligent thriller just doesn’t work. Stuck in the middle, the film meanders for a while until it reaches a cross road not knowing what road to take. Randeep Hooda needs to shake off the dust and not get stereotyped playing similar roles. It’s time he had fun and let his hair down for a change. A muddled affair, John Day seems lost in its own maze of self-indulgence. Not for a while have we seen a film so steeped in despair, so swathed in anxiety, so audaciously draped in despair and yet it engages our senses without miring the plot in morbidity. “John Day” brings the indomitable Naseeruddin and the intriguing Randeep for a taut cat-and-mouse chase that stays a step ahead of the audience right till the shattering end-game. For a film about losers “John Day” proves to be a paradoxically profitable movie-viewing experience for the audience. What’s Good: A unique narrative style, thrilling locales and Naseeruddin Shah. What’s Bad: Everything everything else. Watch or Not? : Ahishor Solomon’s John Day is an absolute disaster zone despite a promising style of storytelling. Roughly lifted from the 2002 Spanish flick, La Caja 507, the film is tediously monotonous and so insipid that it will seem like a never ending torture that’s inflicted on you. The thrilling story goes haywire as the screenplay fails to cement its fiber. A few dialogues are aplomb but the frustrating show is so exhausting that you might spare yourself this horror film.